Nutritional support for early growth phases. 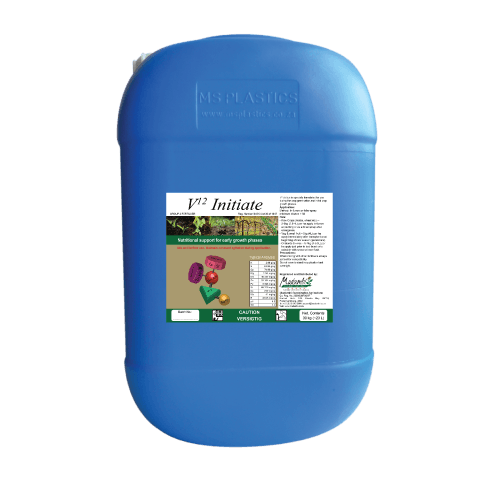 V12 Initiate is specially formulated for use during the crop germination and initial crop growth phases. In furrow or foliar spray minimum dilution 1:50. Row Crops (maize, wheat etc.) – 3-5 kg (2.5-4 L) per ha apply in-furrow at planting or as a foliar spray after emergence. Veg & small fruit – 5 kg (4 L) per ha apply immediately after transplant or at beginning of new season (perennials). Orchards & vines – 5-7 kg (4-5.5 L) per ha apply just prior to bud-burst or to coincide with seasonal root flush. Maintain constant agitation during application. Precautions: When mixing with other fertilisers always jar test for compatibility. Do not leave to stand in application tank overnight. Nutrition for germination and early growth phases. Improves rate of seeding emergence and produce a more even crop stand. Improves seedling vigour and produce stronger seedlings. Sets the platform for optimum yield. Calcium, silica and micronutrients in V12 Initiate support rapid growth in the early stages.